There are only so many lions that have made their names especially known in our modern culture. There’s the adorable and charismatic Lion King—whether in his cheery youthful state or his admittedly understandable conflicted one. There’s, of course, the King of the Jungle, the mighty ruler of the animal kingdom known for his powerful roar and only occasionally thorn-troubled paw. And, then, there is the Cowardly Lion. 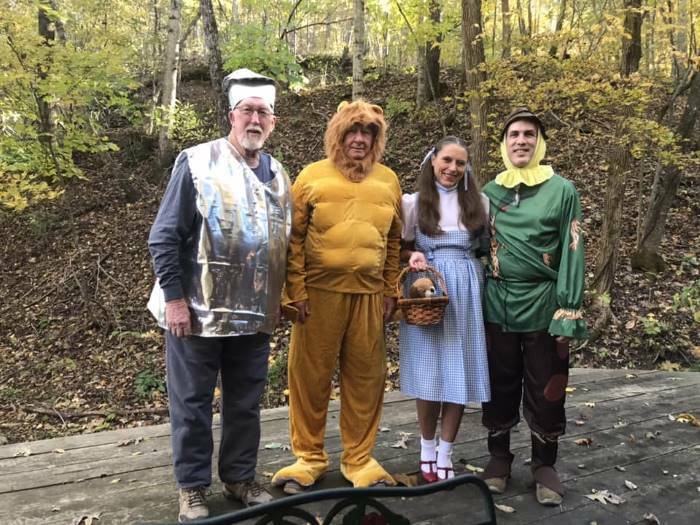 When you put all three in a lineup, there’s certainly a struggle in seeing the lion of Oz as matching up with his other two cousins, isn’t there? Certainly, we shouldn’t see some understandable fear as that much of a problem, barring him from equal standing with the rest of his kin. The poor guy is, after all, dealing with a flying wicked witch! That said, there is no reason that we have to sentence the poor guy to permanent cowardice. All he needs is a little self-confidence. He is, after all, a pretty buff feline! Working out his fear through some aggression and muscled toughness is more than reasonable. After all, if you look like nobody would want to mess with you, who needs real courage, anyway!? Time to give the ‘Cowardly Lion’ some time in the sun and show off another side of his mighty personality. 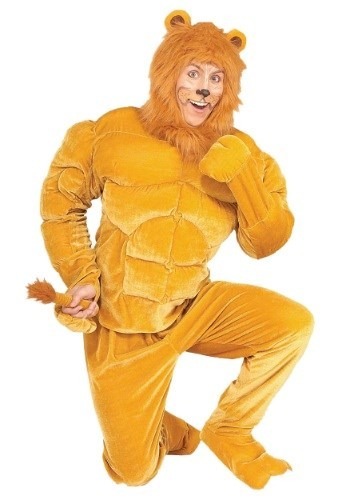 You can help by stepping into this Plus Size Macho Lion costume. The polyester velour shirt has fabric ties and convenient loops to manipulate your furry paws as well as fiberfill padding over the stain-lining to give you the muscles deserving of a mighty lion while remaining comfortable on your skin. Matching pants give you your mighty tail… but it is the satin-lined hood and its glorious faux fur mane and sculpted ears that will have you roaring. Show off this new side to an old friend and let the world know that this peaceful lion has plenty muscles to bear… and he’s not lion. This was a hit at the Halloween party. Never could get the tail to look right though. And the pants were too long.